Everybody is a salesmen. Every day, without knowing it, we sell something to someone. Now, the typical vision people think of when they hear the word “sales” is the sleazy used car salesperson who does whatever they can to get you to buy the clunker on their lot. But selling is not an action tied to money and products. Selling is about convincing people to see your point of view and act on it. If you want your company to cover a trip to a conference, you may have to sell the idea to your boss. If you want to buy that new big screen TV, you have to sell the idea to your significant other. If you want to go on a weekend fishing trip with the boys you might be called in to help sell the idea to your buddies wife. We all sell, but we don’t all sell very well. 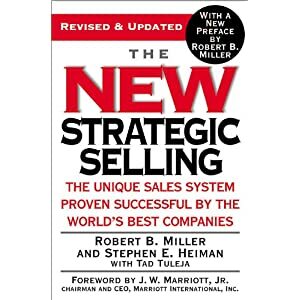 So enter The New Strategic Selling, a book based on the sales course put on by the Miller-Heiman group. In fact, this isn’t really a “New” strategy to selling as its been around for a number of years. But the concepts they present, the ideas about selling, these are still very radical based on what most of us have experienced. Gone are the high pressure, win at all cost, GlenGarry-GlenRoss style of sales…instead the book presents a framework to switch to need-based selling. It’s the idea that instead of going in raving about a product or service, you build a relationship where the buyer expresses what their needs are and your response is to present a solution that best fits that need. Instead of focussing on the amount of money you can squeeze out of a client, you focus on whether everyone wins, that they receive win-results from the engagement, that repeat business is developed over time delivering value over and over again. The great thing about the book is that what it teaches…things like how to identify different buying influencers, how to prepare for meetings, techniques to solicit information about what the buyer is really thinking/feeling…these things are entirely applicable in *any* situation that you need to sell to someone…and remember: selling is convincing people to see your point of view and act on it. So that new big screen TV you want to buy but need to convince your wife on? This book can help you. That training opportunity you want your company to send you on? This book can help you. The upgrade to your community park that you want to lobby the local civic authorities for? This book can help you. The book is a bit wordy. I found that the length could have been reduced and the points still have gotten across. That’s really the only knock that I have though; the insight that it provides is so worthwhile that having to chew through extra words is well worth it. You definitely don’t have to be a professional salesperson to benefit from this book. Hi, can you tell me the specific of your book club.